With the government declaring 2018 The Year of Engineering, SES Engineering Services (SES) has set out to inspire the next generation of female engineers by hosting its annual Hovercraft Day challenge at The Mount School. Returning for a fifth year, the action-packed event proved that girls from eight local schools across Yorkshire have the imagination, creativity, and teamwork to become the skilled engineers of the future. With the construction industry facing a serious skills shortage, encouraging young people – especially young girls – to consider a career in engineering, is critical to the UK economy. Sponsored by SES, the competition challenged over 70 Year Six girls to work together to design and build their own hovercrafts, before racing their creations in an exciting knock-out tournament to determine the overall winner. Throughout the day, the York girls’ Quaker senior school hosted workshops with Year Six girls from Belmont Grosvenor, The Mount Junior, St Paul’s Primary, St Wilfrid’s Primary, Terrington Hall and newcomers Hensall Primary. The students worked together in teams alongside their own teaching staff and Sixth Form students from The Mount. Each craft was powered by a leaf blower engine in order to carry one ‘pilot’ from each team along a specially-built racing track. At the end of the workshop the hovercrafts were judged for their design by SES’ Planner Rachel Schofield and following a thrilling race, The Mount Junior team was presented with the winning trophy. Rachel Schofield said: “Hovercraft Day has yet again been a great success. The girls showed persistence and innovation and the final designs were outstanding. “It’s always inspiring to see the schools so passionate and supportive of their team mates and it really reflects the true spirit of the day. I have no doubt that in years to come some of these girls will be future SES employees – working on substantial projects in the community. “As 2018 has been named The Year of Engineering, the Hovercraft Day perfectly replicates the campaign’s initiatives by challenging perceptions about engineering. Engineering touches every part of our lives however, not enough young people – especially young girls – think it’s a world for them. “Equality and diversity have been a hot topic in the engineering sector for the last few years and it’s widely recognised that the industry is playing catch up. “SES believes that the responsibility lies with all industry workers to try and engage the younger generation, male and female, to inspire and equip them with the skills to face the exciting challenges of tomorrow. “It’s amazing to think that the first group of girls who came to The Mount to take part in SES’ Hovercraft Day are now preparing to sit for their GCSEs,” says Adrienne Richmond, Principal of The Mount School. “I’d like to congratulate all of today’s participants and hope this experience will broaden their horizons for what they can do in the future. Engineers creatively apply scientific knowledge to solve physical and conceptual ‘real world’ problems; it is important that more girls and women choose to work in this field and influence our emerging future. “Girls’ schools have a key role to play because, as research shows, girls at girls’ schools perform better in STEM studies. The Mount is the region’s leading all-girls school for A-Level results. Last year, around half of our Upper Sixth Form left to study STEM courses at university, with ten percent of leavers studying engineering. 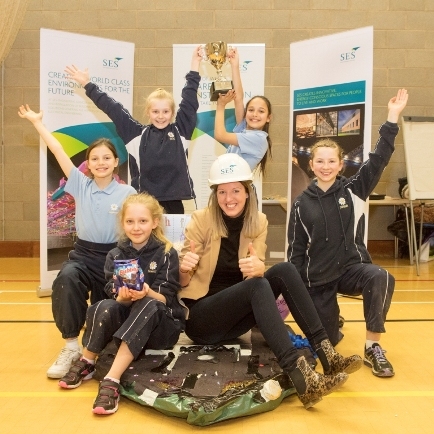 MP for York Central, Rachael Maskell, said of the event: “I support this event year on year and it’s wonderful to see The Mount School and SES Engineering Services again encouraging a future generation of female engineers. “I hope SES’ annual Hovercraft Day events continue to encourage more girls to study engineering and physics and fill the skills gap the sector is currently suffering from. There really is no limit to what these girls can achieve.